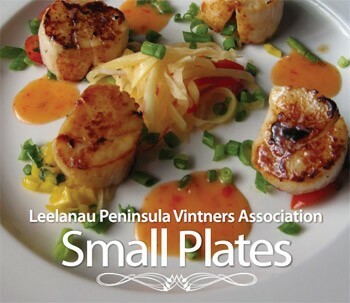 The Leelanau Peninsula Vintners Association presents their second annual LPVA Small Plates event on Saturday, June 18 2011 from 6-9 PM. Participating wineries will be offering a full glass of wine with a well-presented and substantial tapas dish in their tasting room. You can purchase tickets online for $11 for any or all of the three seatings (roughly 6-7, 7-8 and 8-9). Many of our wineries are working with chefs to prepare and serve the pairing, and the event is designed to be a high-class food offering, catering to culinary aficionados. Wild mushroom dusted sea scallop with a bundle of truffle oil infused fries wrapped in prosciutto, asparagus tips and smoked yellow tomato coulis paired with 2010 Sur Lie Chardonnay. Assorted Pates, Proscuitto, Sausage, Rillette, accompanied by a selection of Cheeses,Veggies,Bread, Crackers, and Mustards. Rillette is a shredded duck/pork mixture served warm and it is paired with 2010 Woodland White. Tony Ciccone (Owner/Vintner) will be attending the event featuring a Roasted pork loin with a sausage torteloni with black truffle cream from Tuscan Bistro paired with 2009 Tre Rossi. Parmesan encrusted walleye over a bed of white wine risotto and an in season greenery prepared by Shawn Bottruff from the Bluebird. Perfectly pairing with the 2009 Pacific Rim Internationa Best of Class award winning Pinot Gris! Featuring a Costa Rican Chalupa & Beef Fajita Wraps paired with 2008 Leelanau Peninsula Merlot. Chicken Pad Thai with spicy green curry sauce (pick your “heat” level) prepared by 22 Vines Restaurant. This will be paired with 2 different ‘sec’ sparkling wines – Wet and Consort. Petite crab cakes with a red pepper coulis paired with Silver Leaf Chardonnay 2009.